Welcome to the Royal Kingdom Adventure Castle. Fantasy and adventure abound in this mighty fortress built for endless entertainment—just beware of the dragon! 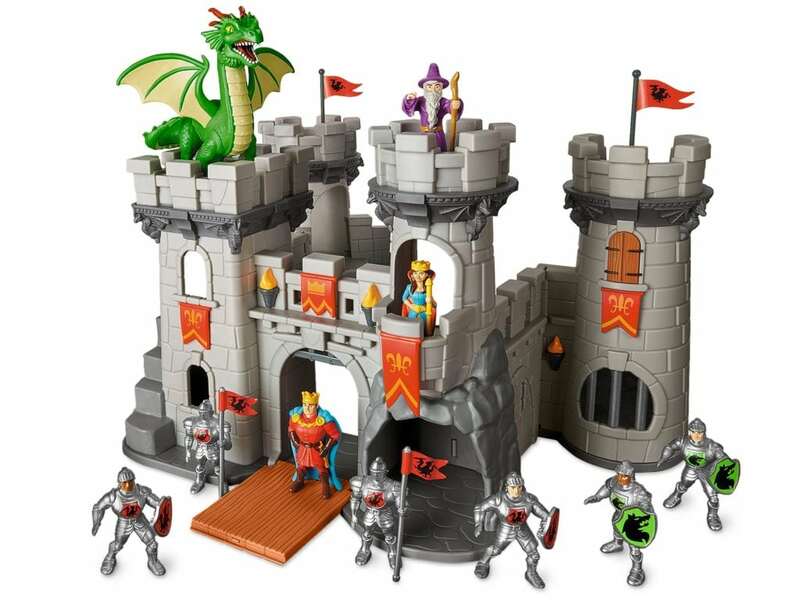 The castle walls open to reveal exciting play spaces, where the wizard counsels the king and queen, and the knights and guards defend the kingdom. There are chambers to explore, stairs to scale, towers for keeping watch…even a dragon’s lair. The castle also features a drawbridge and dungeon door that really work. From our NAPPA team: The fun factor is immediate because the castle comes preassembled. Kids will enjoy positioning the knights and dragon in battle while improvising scenes with the king and queen. The knights reveal an attention to detail with shining armor and distinguished swords. Additionally, the dragon is exceptionally detailed and visually appealing. Easy to move from one room to another. Promotes creative play and storytelling.